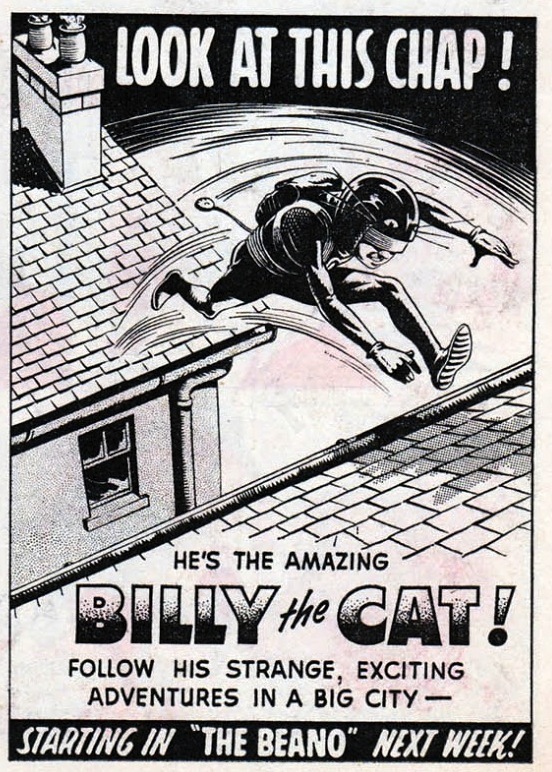 Bring back Billy the cat! :) and super school!! Billy the Cat and Katie was my favourite strip in The Beano as child. My favourite story being about a kid with similar skills to the Cats stealing a Cat costume from a waxworks and going on a crime spree - framing Billy in the process. If I remember correctly, the story finally ends with them fighting on top of a Double Decker Bus. Oddly enough, Sid, although I read both The Dandy and The Beano for 11 years (1964 to 1975) the Beano stories never really stuck in my memory as much as The Dandy stories did. I'm sure you're right about that story though. I threw out most of my 1960s/70s Beanos many years ago and haven't missed them, but I was eager to buy a replacement set of 1964 Dandy's (which I did, back in the 1980s). Hi Peter, Yes, Super School could have fit right in with the current superhero trend. Maybe even turning it into a comedy serial. It was always popular. Ah well. 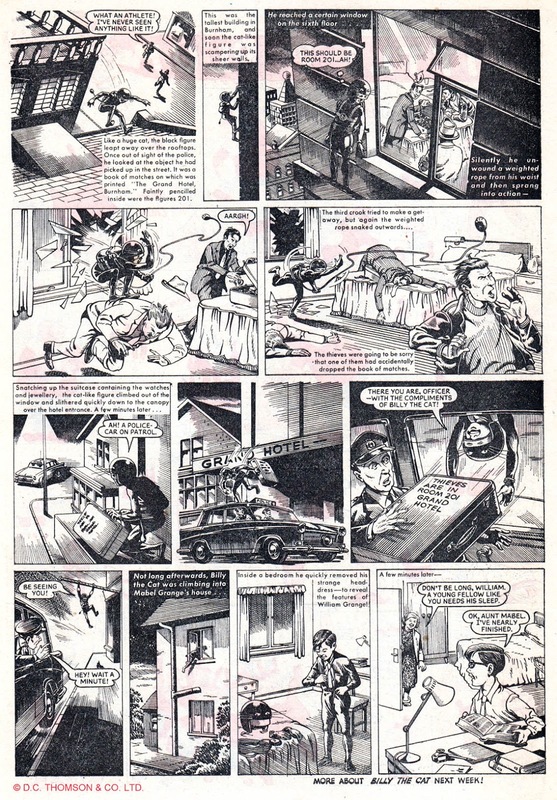 I'm not sure if the strip ever explained Billy's acrobatic prowess or where he got his outfit, but the second instalment did inform us that his parents were both police officers whose car was forced over a cliff by a gang of criminals. Ha! To be honest a lot of the early Batman comics involved a lot of serendipity clue gathering wise! 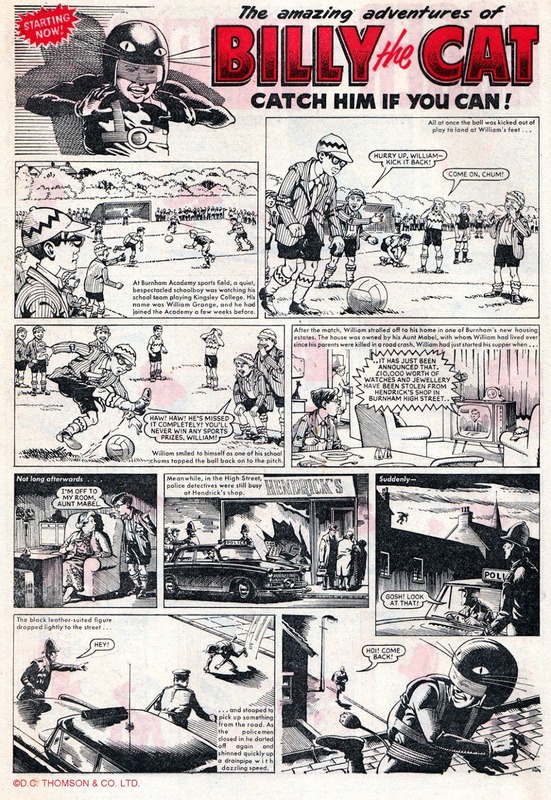 I'm hoping with the buzz around Rebellion and their publishing of all there action comic style books, and what with the superheroic films we have at the moment, that DC Thomson will release a few collected copies of Billy and General Jumbo. I'm sure I'm not the only one interested in something like that. If Super School was popular why did The Beano drop it? It would probably fit in even more now, since Bananaman is now also a Beano character, and there is of course one more Beano character with superpowers - Billy Whizz. Though the title would be a misnomer nowadays since I guess they'd change the setting to Bash Street School. That Billy the Cat prose origin was good, though it's odd that it was set in 1950 instead of 1967. I liked that it said that they disappeared after a decade. They'd be in their 20s by then, and I would imagine that William joined the police. of course, I would have preferred the more marvel way of NOT saying what his outfit was made out of or at least making up something (a lot of outfits at first were cloth, fantastic four had 'unstable molecules', X-men had cloth before special body armour.. or if you go by them.. ehm.. films.. Spantex and Leather ¬_¬). Leather is a pretty bad choice.. very noisy, smelly, hot.. but this is fantasy, not real life, so it is made to work ^_^ Apart from the hints about his father, the inventor who died) did they ever do much of an origin? too many things get bogged down with having to make one.. one reason that Stan Lee claimed to have invented 'mutants'. he was fed up with having to come up with origin stories. Also, they really slow down the action a lot. Wow! The art is superlative! Are the weekly Beanos gathered anywhere in a trade paperback or something equivalent? I do have a decent collection of annuals from the 60s and 70s I would be interested in reading the weeklies. James, as you know, The Beano tends to retain its core characters (Dennis, Roger, etc) but the newer strips tend to get replaced. Sadly, Super School fell victim to that. Perhaps they'll revive it in 60 years like they did with Big Eggo, but I'll be long gone by then. No Beano trade paperbacks, Charlie, unfortunately. Pity, as so much of that classic material deserves to be reprinted. Manic, no, they didn't reveal his origin but there's fan fiction at that link I provided that gives a version.